countries with cheaper operations have made outsourcing a key element of supply chain upgrading. Consultants also examine the things that happen outside of the manufacturing plant and the warehouse. Financial and customer services play a role in the supply chain operations. Your consultation firm would provide you the suggestions in the areas where you can improve and combine operations that can enhance efficiency. Supply chain is the backbone of any company and if it is not performing at its highest potential, the company may experience loss in times where it can easily thrive and succeed. Executives are given the task of managing and upgrading the supply chain operations to keep the company financially stable but they canâ&#x20AC;&#x2122;t do it alone. 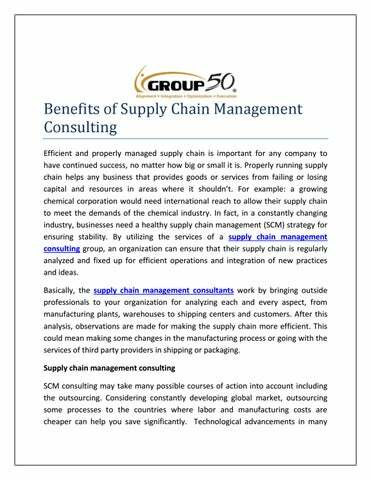 Supply chain management consultants can give huge insights and recommendations to a company for making sure that the operations run as efficiently and smoothly as possible. Hiring a supply chain management consulting partner Leading companies employ the services of such consulting firms as they are aware of the value that they can bring to the table. 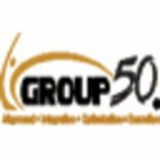 Group 50 is a well-known supply chain consulting firm that implements innovative methodologies for bringing effectiveness at all levels of a supply chain. They can help you in improving logistics cost, efficiency, effectiveness and overcoming the supply chain challenges that your company is facing. Their consultants can make supply chain management an easy task for your company and they have been doing it for companies of all sizes across a wide range of industries.